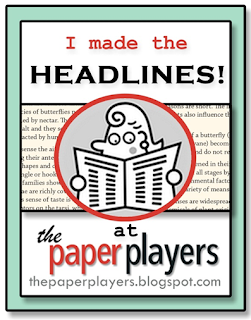 Before I share my card for this week’s Paper Player’s Challenge, I’m excited to let you know that my Paper Players card from last week was selected as The Headliner for the week. Remember the one-armed bear I created for Joanne’s colour [sic] challenge? If you don’t remember, you can see it here). I’m always so inspired by online challenges and look forward to sharing my projects with the other participants and design team members. I don’t ever expect to win, but it’s always nice to be recognized by the panel of artists. Thank you, Joanne James, for selecting my card as The Headliner. All Torn Up. I do love a super-clean card, but it needed something else. Even with the the bumpy watercolor paper, the card needed a little texture. That’s when I decided to use one of the oldest techniques in the book – I tore the piece of card stock with my fingers to create a rough, torn edge at the base of the Crumb Cake panel. Color Pairing. When you watercolor, the rich colors disperse a bit, and variants of the selected color shine through. It’s fun to watch the colors change slightly. After I was done painting these delicate flowers, the Blushing Bride ink appeared slightly more peachy than the true color. As such, I decided to accent the watercolor panel with Pistachio Pudding and Crumb Cake. I like how the pink stands on its own in the middle of the card. 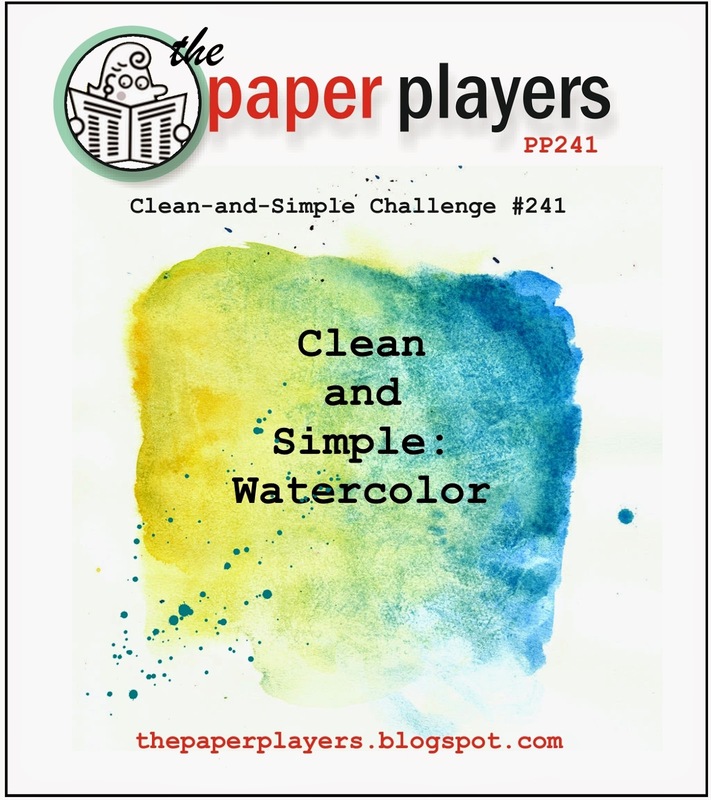 I hope you’ll pop over to The Paper Players challenge site to play along with this week’s challenge. LOTS OF THINGS. There are lots of new and exciting things going on this week and the coming weeks – retired products list, new catalog, free product promotions. I’ve summarized them all for you in one place – click here to read more. beautiful. your critter card was dead on and glad that it was recognized. You are such an inspiration! I love how perfect your layers are. Congrats on being picked The Headliner! Your card was very cute and I like how you used the stamp in a different way! Today’s card is very nice too! I love your clean and simple card Brian. :-). The colors are fantastic! Pretty ! This is a soft and gentle card . Love the colors and I like the tearing detail . I do that on some of my cards and it adds an extra something . A big yay for your little bear card being chosen . It is a winner for sure ! Wonder what is going to be on that Retirement List ????? Super gorgeous and clean, Brian! I love your watercoloring…so special in this set. This card reminds me of sherbet ice cream! Soft, sweet, soothing and delicious! I also think the saying is a reminder to us all to be kind and gentle to everyone we meet. ‘Nuf said. Have a spectacular day. Congratulations! Way to go…but I’m not surprised that your card was chosen. You always do beautiful, inspiring cards Brian. And this card is no exception. Love the colors, and the torn edge is great. I never remember to try that, and it’s such a beautiful way to add texture. Thanks for the daily inspiration….. Hugs! This is such a beautiful card. I love the sentiment and the bit of torn paper. Perfect. And congrats on being chosen as Headliner! So well deserved! Brian, vary beautiful and so pleasant, love those colors !!! Love it all, love the tear layer !!! congrats Brian! your beautiful work deserves to be recognized. I love all of your inspiration and your sharing freely of your incredible talents with others. this card is another winner! I just hate to say it, but I have got to buy that stamp! The Indescribable Gift just keeps popping up all over and I keep wishing I had it, but hate to buy it so late in the season. You just changed my mind. Even if it retires soon, I still must have it for my permanent collection! As always, your card is perfection. And, congrats on Headlining. Beautifully watercolored, Brian! A perfect combo of colors. Thanks for sharing with The Paper Players. Just beautiful Brian – interesting how much the torn edge really adds to the overall layout and feel of the card. I love the sentiment you paired this image with too. Another stunner! Thanks for joining us at The Paper Players again this week!